There was no winner in Tuesday’s Mega Millions lottery drawing. That means the jackpot for Friday’s drawing is now at least $868 million or a cash lump sum of $494.5 million. It will be the largest jackpot in the game’s history and the second largest in the US lottery jackpot history. 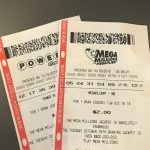 Friday’s Mega Millions along with Wednesday’s Powerball jackpot, which stands at $345 million, are worth more than a cool billion dollars.